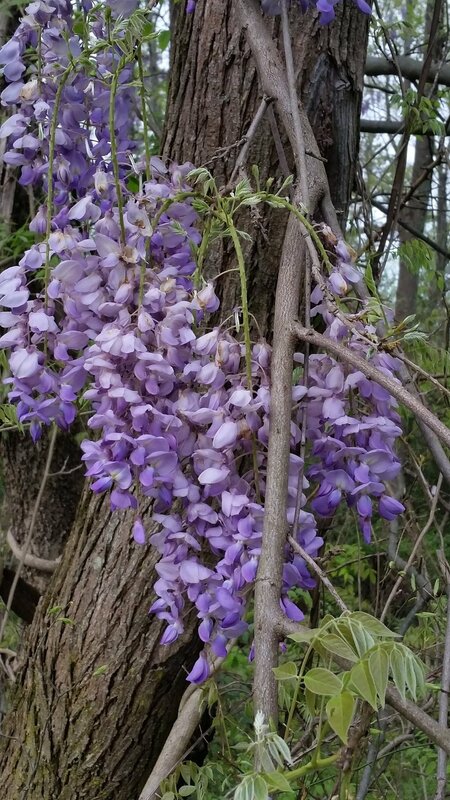 In my part of the southeast, a purple haze of Wisteria blooms contrasts with the tender green of emerging tree leaves. In the woodlands behind my home, Chinese Wisteria (Wisteria sinensis) has climbed to the tops of several trees. Other trees are endangered by their strangling vines. Make no mistake – this is one VIGOROUS vine. The deciduous vines are hardy in zones 5-8. They grow to 40 feet or more and bloom best in full sun. The 4-6 inch velvety seed pods are shaped like violins. When dry, the pods pop and eject the lima bean-like seeds, often shooting them ten feet or more. The seeds are toxic, so wildlife rarely spread them around. Instead the plants spread by roots, by stems, or by self-spread seeds. A less vigorous cultivar, ‘Amethyst Mist’ is more easily restrained and looks particularly beautiful when trained to a tree form. It is worth seeking out. Wisteria is easy to admire. The large clusters of purple and lavender blooms are beautiful. The shape of the bloom resembles a pea blossom, to which the plant is related. Both are in the family Leguminosae. Some people think their sweet fragrance resembles grape KoolAid. The white variety is harder to find but is reputed to be more fragrant. American wisteria (Wisteria frutescens) is less vigorous than Chinese Wisteria, but it still requires a twice yearly pruning to keep it under control. It is also less fragrant. Both Ameircan and Chinese vines must have a level of maturity (up to ten years) before they bloom, which can be a frustrating wait. Despite all the warnings about its rampant growth, it is difficult to resist the lure of those beautiful purple blooms. Plant if you dare, but DO NOT let them anywhere close to your sewer or septic systems. The roots seek water and will cause plumbing problems. A close view of Wisteria bloom cluster. Vine imitating a boa constrictor, slowly squeezing life out of the tree it is climbing. This photo was taken from my car window as I drove down a major thoroughfare. A planted vine has escaped cultivation and spread through the surrounding area.